Inspiration. It comes from many places. A sweet smile from your child. The scents wafting out of a bakery. An impassioned speech from a respected figure. A plate with artfully arranged food. Walking through a museum. Beautifully arranged flowers brightening a room. Inspiration, when it comes, affects us all differently. Admittedly, I am a bit quirky, so when I get inspired it usually sends me into the kitchen. My kitchen represents an ideal arena for self expression, and allows creativity to be channeled in wonderful ways. Take, for example, a recent weekend morning. Inspiration came in the form of wonderful weather, the promise of a great bike ride, and a powerful hunger. The morning was a lovely temperature and getting outside to enjoy the budding day was in order. So Denis and I decided to take a long trail ride on our bikes. But first we needed to power up with a breakfast that would provide much needed energy for our ride. Eggs, Canadian bacon, and hash browns sounded delicious. The thing is, I am not a big potato fan-unless it is breakfast. I just adore hash browns. They are crispy on the outside, creamy on the inside, and just plain yummy. But they can be a pain to make, and take a bit of talent to make well. I’ve tried pulling out my cast iron skillet, oiling it up, shredding potatoes, seasoning them, they frying the heck out of ’em. That was my best attempt at delicious home made hash browns. And they were just so so. Then inspiration hit in the form of my trusty old waffle iron. And I made the Best.Hash.Browns. Ever. This is how I started-my waffle iron, potatoes, and some cooking spray. I also had salt and pepper on hand as well. I plugged my waffle iron in and set it to preheat at a medium temperature. While that was heating up I pulled the preshredded potatoes out of the freezer and quickly defrosted them. I squeezed out the excess water. When the waffle iron was good and hot I sprayed it with a generous amount of cooking spray. I then placed roughly 2 handfuls of shredded potatoes on the bottom plate of the waffle iron. I sprinkled salt and pepper on top, then placed the top plate over the potatoes. The potatoes started sizzling away. Denis was busy working on the eggs and Canadian bacon while I fussed over the hash browns. Since this was an experiment with no recipe, I was not sure how long to let the potatoes cook. I watched them closely. After about 6 minutes I gently lifted the top of the waffle iron to take a peek at breakfast project. What did I find? Perfection. Absolute deliciousness. I used a spatula to remove the “potato waffle” from the iron. It slid off the iron and onto a plate with ease. The waffle iron made amazing breakfast potatoes. This paired with our eggs and bacon very well. The trail ride, with inspiration from the breakfast, was a rousing success. Will I try this again? You bet! But next time I will mix in some diced bell peppers and maybe even some cheese. I can’t wait for my next inspiration! Failure. It is a scary word with negative implications. Failure can be defined as: “An event that does not accomplish its intended purpose”. Well now that does not seem too awful, does it? Progress can certainly be made even when not accomplishing an intended purpose. Sometimes a new purpose can emerge. The word failure is more daunting than its definition. I have failed. Many times. We all have. But failing does not make you a failure. If you haven’t failed, you haven’t taken any risks. So take risks, because if you are taking risks, you are succeeding. Failure appears in big ways and small ways in life. Get over it, move on, and try again, and again, and again to succeed. I recently tried roasting some kale. My technique just didn’t work. My son said I had a “kale fail”. And he was right. My family will continue to enjoy kale…but I will prepare it in other ways. 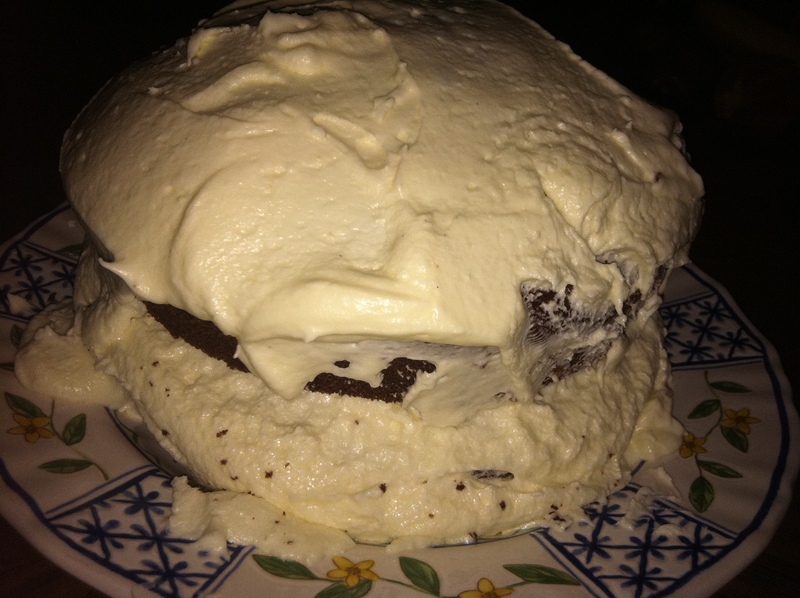 Then there was the time I became a bit impatient, and tried to frost a cake with frosting that was too thin, and tried to put it on a cake that was still too warm. Typically, for most frostings or icings, it’s just not a good idea to put it on a warm or hot cake. It melts off. And I proved that right with my impatience. Trust me…I know what I am talking about. If a recipe flops, it should only happen once. The next time I try that recipe, or another recipe, the lessons I learned by having that recipe flop will help me succeed the next time. So how is that a failure? Learning something is always a success. The experience of making a recipe well as well as having one go wrong both make me a better cook and increase my understanding of the culinary arts. Either way victory is mine! Failure, whether real or perceived, can produce many reactions. Fear, doubt, and depression to name a few. We need to shake free of that, because failing can lead to success. In other words, failure can, and should, drive us toward feeling empowerment, a step forward. It may not be immediate though. Sometimes success takes time to grow out of a mistake or failure. So failure can also produce the opportunity to learn patience. Wow! Fantastic things can come from “failure”! So lets not fear it. Take it for what it is. It is an opportunity. Success. Confidence. So go take the risk! You can’t fail! This cake wass a flop. It is ugly, but it tasted good. But since I strive for beautiful food, it was a flop. I have been cooking for years. I enjoy cooking, food, and the fellowship that meals together provide. My meals are typically nutritious, flavorful and have a bit of a flair in its appearance on the table. I am usually into presentation…it is my artistic side expressing itself. I put thought into food, meals, and the ambiance of the event. As I have said in previous blogs, sometimes I get too tired to really pull out all the stops when I cook. But for me, cooking is usually a pleasure. I have friends that find “Whats for dinner” a dreaded comment when directed their way. I can’t relate to that because I enjoy cooking. I can always pull a quick meal together, or an elaborate one given the time. I realize, however, that I have lots of experience. And made lots of mistakes. In fact, I still make mistakes, but now I can usually quickly evaluate and fix them. As the Julia Child quote says, I spent a lot of time with that what-the-hell attitude when learning to cook. I dug in, started cooking in earnest in college, and went from there. Cooking is like math though. You begin with a foundation, a very basic one, and then go to the next level when ready. You can’t do division without understanding addition, subtraction and even multiplication. And with cooking, you can’t bang out a complicated sauce or a fantastic roast without a foundation on which to build. My youngest son gets easily frustrated sometimes. When that happens, many times it is because he wants to be good at something and tries to master it right away. When he first started playing chess, he would sometimes quit in the middle of a match when he saw that he could not win. I would tell him that you can’t expect to win Wimbledon the first time you pick up a tennis racquet. When he finally won against a well respected opponent, he was thrilled. He still talks about that match because the success was hard won. He earned it. Working toward something develops, amongst other things, a good work ethic. Working toward getting better at a skill, which cooking is, takes time, experience, and patience. It isn’t a “home art” taught in school like it once was. Now we kind of have to take the initiative and teach ourselves to cook. And like anything, when you apply a solid work ethic to it, great things begin to happen. Great things like confidence. Fun. Enjoyment. Satisfaction. Confidence is not something you “get” or something someone can give to you. It is something earned. And the only way to earn it is to be put or to put your self in situations to take a risk and experience small successes. Once the foundation is there, confidence is instilled, and growth occurs. Blocks on which to build. Start cooking. But don’t take yourself seriously. Start with a simple recipe and a few inexpensive ingredients. Make it easy on yourself. Soup is easy. Baked proteins with rubs or marinades are easy, like pork tenderloin or chicken. Roasted veggies are a snap. Salad dressing is simple. Don’t be afraid of ruining a recipe, wasting ingredients, or disappointing yourself or others. Get positive energy from taking a risk…and gaining confidence. Take Julia Childs “what-the-hell” attitude with you and have a blast! I was thrilled to get something new to cook with for Christmas. I love to try new cooking techniques, new recipes, and new ingredients (remember last fall when I declared pumpkin was the new bacon? I used it in everything for weeks!). Things like this really get my creative juices flowing. I was jazzed! These were not the kind of salt blocks I was accustomed to growing up in the midwest. We used to get big white blocks of salt at the grocery store to add to the water softener in a (dark and scary, if my childhood memories serve me right!) corner of the basement. Chicago and its suburbs had hard water, which made using water a bit less efficient in some cases. Large salt blocks and a water softener are de rigueur with hard water. No…the salt blocks I received are different from the salt blocks of my childhood. But I digress. I started heating my salt slowly to about 500 degrees over 30 minutes. I hit the internet. How, exactly, do you cook with these blocks I wondered. Well it turned out to be pretty simple. The blocks can go right onto a stove or grill burner to heat and cook. So that is what I did. The salt needs to heat slowly, and get to a temperature of about 500 degrees over the course of about 30 minutes. Easy enough. Recipes to cook on salt were surprisingly plentiful. Everything from steak to scallops can be cooked on them. But being health minded, I was concerned about the salt content of food cooked on salt. Turns out I didn’t need to be. The salt blocks impart little salt during cooking. Considering the amount of salt in prepared foods, cooking something fresh and salt free on salt is certainly an option! I discovered that using them occasionally for those of us watching our sodium but not on sodium restricted diets is just fine. Armed with this information, off I went! When trying something new, I am cautious with ingredients. I was not going to start this experiment with an expensive cut of meat or piece of fish. 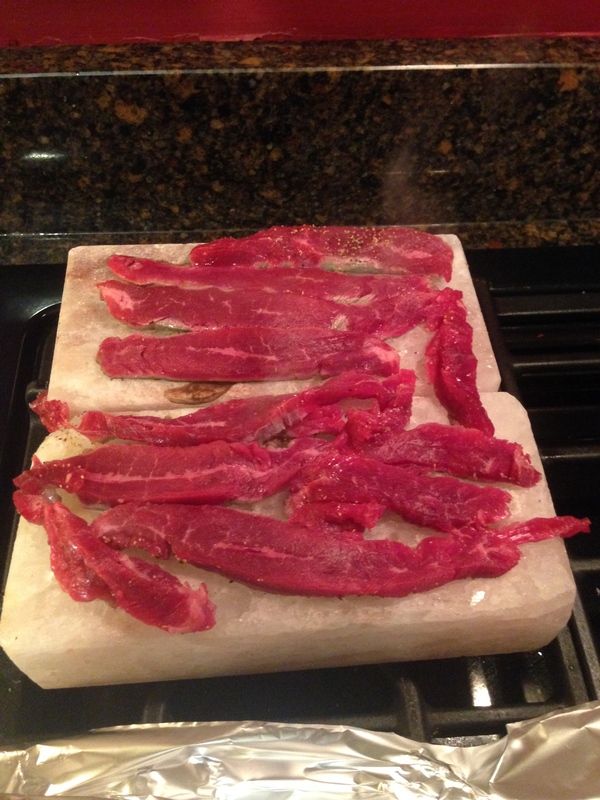 I began with a small piece of flank steak. I ordered it freshly cut from my butcher. 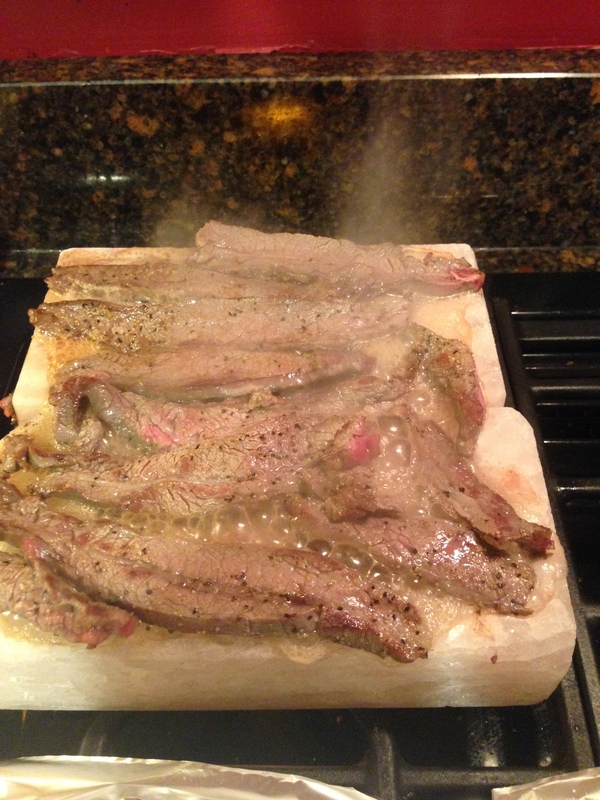 When preparing to cook it, I began heating the salt blocks and sliced the steak into thin strips. I did not season the meat at all because I wanted the full experience of the salt flavors on the steak. When the blocks were hot onto the salt it went. On to the salt the steak went. It began sizzling the second it hit the salt! The meat sizzled and cooked beautifully!cooked steak, I flipped the pieces over after only about 30 seconds. The sizzling continued. steak, I flipped the pieces over after only about 30 seconds. The sizzling continued. I had a large dinner heading to the table, with the steak being simply an accoutrement to the meal. It was an all inclusive experiment, as everyone at the table got one or two pieces of steak to taste. The excitement built as the steak was tender to cut. And to our delight the flavor was outstanding! It was a two thumbs up night! The steak was a hit. 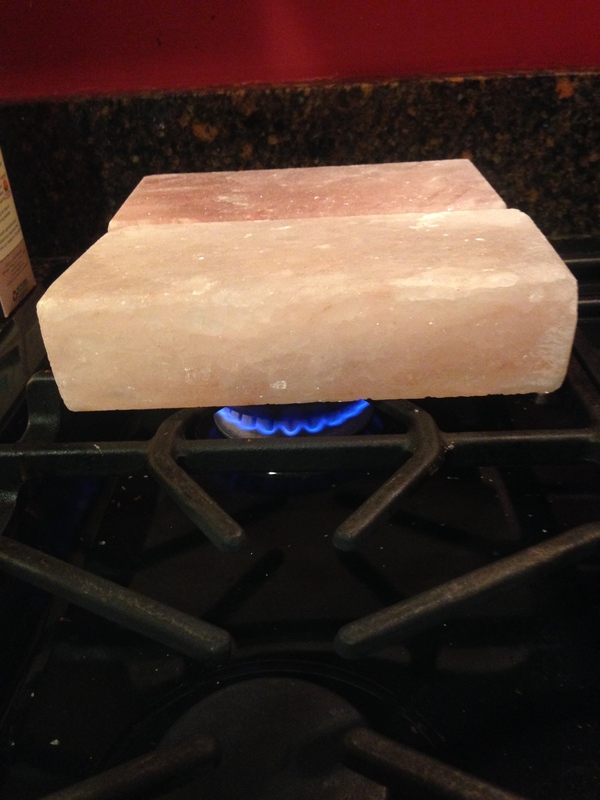 Now my question is what to cook next on my salt blocks. I think it will be sea scallops but I will let you know! A quick word about serving on these salt blocks. I found suggestions to serve produce that folks like to salt, such as melon and tomatoes, on the blocks. You simply slice up a melon, for example, and lay the pieces on the salt block. The melon will absorb a bit of salt producing a juicy salty sweet hot weather treat. I can’t wait to try that, but it will have to wait until summer rolls around for that one. Until then, I am going to continue to experiment cooking with my blocks. I will keep you posted on my progress! Bon appetite! I was recently called a “refrigerator cook”. Everyone who knows me knows how much I love to cook. I have taken oodles of cooking classes. I have attended all sorts of classes, from Le Cordon Bleu to local celebrity chef classes. I have been cooking my whole life. I love food, I love the socializing that happens around meals, I love healthy cooking, and I love bringing family together with celebrations of food. But a refrigerator cook? Whats that? I am told that I have a talent for opening up the refrigerator and pantry and coming up with something fantastic. Whether it is an appetizer or a whole meal, I seem to be able to pull something yummy together. And I have a blast doing it. What let to my label of being a newly crowned refrigerator cook? Recently, it was my Saturday afternoon football watching bar food. Here’s what happened. After a morning of running errands, we came home hungry. We turned on college football, and unloaded from the errands. I looked in the fridge to see what I could throw together. What is better than bar food for a Saturday afternoon? I pulled out leftover chicken taco meat, cheese, flour tortillas, a can of black beans, some fresh cilantro, salsa, and sour cream. Next, I pulled my big skillet and put it on the stove. I warmed up the taco meat in the microwave. While that was heating, I sliced some delicious cheese and chopped up a bit of cilantro. I turned the burner on under the pan and sprayed it with non stick cooking spray. Then I started layering up my quesadillas. Meat, beans, salsa (not too much or it gets soggy), and cheese. Into the pan it went with a medium fire under it. I like to cook my quesadillas slowly so the cheese can really melt! After a few moments, I took the quesadillas out of the pan and put them onto a cutting board. They cooled for a moment, then I sliced ’em up. I put it onto a plate, garnished it with some fresh cilantro, and added a small bit of sour cream. Yum! Grab a beer, and a napkin too. Enjoy that good game with a simple and easy food! This can also be a great after school snack, or you can add some fruit and make it a nice meal. I like to keep staples on hand so I can always pull something out to cook quickly. This takes planning and experience, but anyone can do it. Now is a great time to start gaining experience! And the only way to get experience is to get busy. Get some extra items at the grocery store for the fridge and pantry, and you too can become a refrigerator cook! How to stock a pantry? Tune in next time. I will guide you! Saturday afternoon home made bar food! Perfect for watching college football!